IYC banner installation – with video! Comments Off on IYC banner installation – with video! IYC 2012 continues apace. 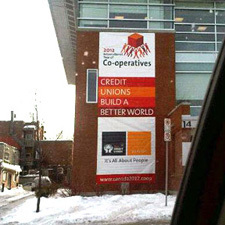 Thanks to it being wholeheartedly embraced by co-ops across Canada, not only do we get to see all sorts of cool photos, but now we have this time-lapse video of a vinyl10′ x 40′ banner we made being installed at The Co-operators head office in Guelph. Bucking tradition, they did not use “Yakety Sax” as the soundtrack, but “Ride of the Valkyries” totally works here. Providing IYC 2012 products has been our big project this year, and we’re quite proud of all products we’ve made to help co-ops and credit unions get the word out. I’m not sure if we’ll have the same success with 2013’s International Year of Quinoa, but we can hope. 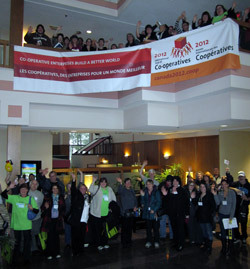 If your co-op wants its own building banner, see our IYC website for details. While we see IYC products every day, they are usually all nestled together in boxes or in stacks on the floor. We look forward to the newsletters sent out by the CCA because they almost always have the action shots! 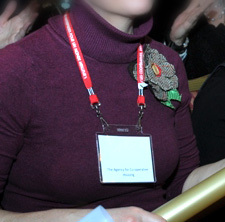 At the IYC launch in Ottawa, our lanyards were on full display. Meanwhile in Guelph, the paper flags were a big hit. Here’s a large vertical banner we did for Your Credit Union in Ottawa. With a name like that, they have no doubt heard every “Who’s on first”-type joke available so I will refrain from making one now. I don’t think anyone is going to miss seeing a banner this size which means great exposure for both YCU and IYC. The Golden Horseshoe Co-operative Housing Federation in the Hamilton/Niagara region of Ontario had this banner of ours at their AGM as part of the launch of their new scholarship program. It’s only February! 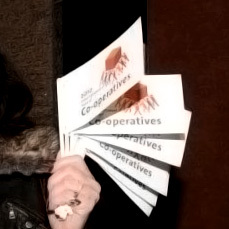 We still have 10.5 months left to keep celebrating the International Year of Co-operatives. See our dedicated IYC site if you’d still like to order. Photos are from the IYC 2012 Matters newsletters. Two of our franchise owners were quoted in Flag Day articles in February. Guy in Winnipeg talked about the best-selling flags in his shop (hint: Canada comes first, but they’re awfully fond of their new hockey team) for Winnipeg Free Press. Betty in London contributed her knowledge of flag etiquette including when to replace an old flag for LFPress’s Flag Day article. If you have any flag questions of your own, we’re always happy to help! Just contact your closest Flag Shop for more information. As beautiful as our printed textiles are after they merrily roll off of the printing press, they require a little finishing before they are ready to go. The finishing process along with other sewing projects (like appliquéd flags) generates scrap material which then piles up in our production area. Common Thread Cooperative who shares space in our building already takes a part of the stash, but we always have plenty more. Lately, we’ve been donating extra scraps to the Banner Bags program which puts them to good use. Banner Bags is a program that educates high school students on environmental friendliness by repurposing old street banners and other donated scrap materials into bags in their sewing classes. Brenda and Rebecca will be attending the Beyond the Bag Eco-Fashion Showcase in March to see what all our recycled scraps have become. Here’s a sneak peek that their project manager Lauren sent us ahead of time. If you are interested in supporting Banner Bags, contact Lauren Watkins at bannerbags@sifesimonfraser.com. 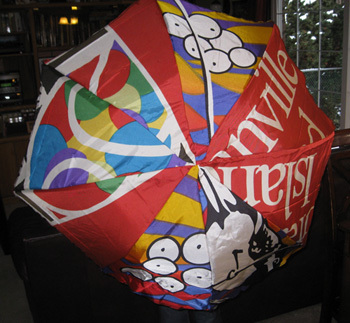 You are currently browsing the The Flag Shop Blog blog archives for February, 2012.